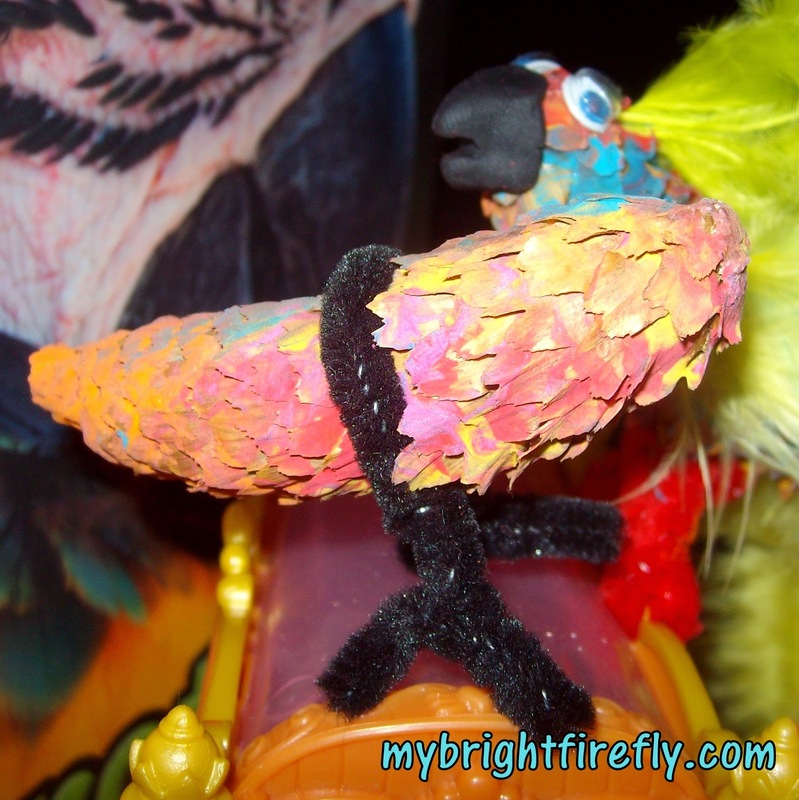 My Bright Firefly: P is for Pinecone Parrot. Invitiation to Play: Compare and Contrast. P is for Pinecone Parrot. Invitiation to Play: Compare and Contrast. 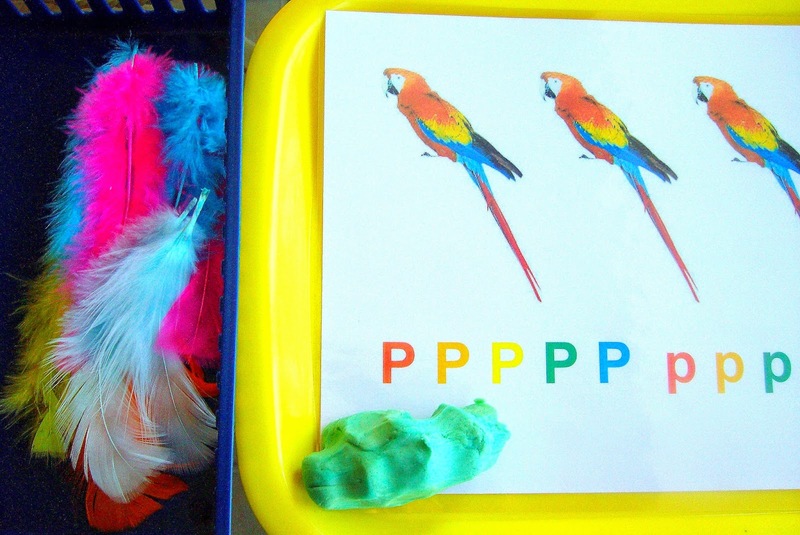 Bird's body parts, building a parrot, review of colors, practice on same and different - does it sound boring? We tried to make it fun and creative with fine motor skills practice and sensory nature exploration. My Firefly collected fir cones on our evening walk around the neighborhood. I washed and dried them and invited her to paint them in the bright "parrot" colors. She totally loved them. We could stop right here: the pretty fir cones make a great decoration by themselves. 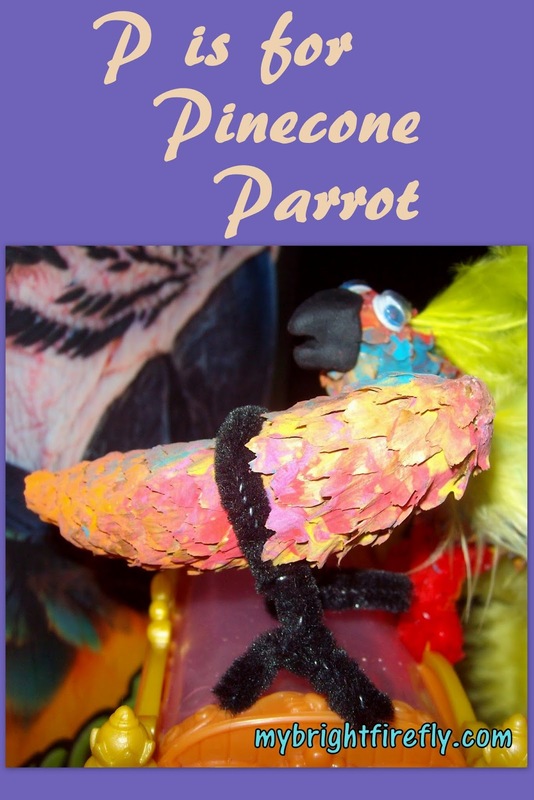 The parrot pictured below is from our book of the week: "Parrots" by Fran Howard. This book is a part of "First Facts" set. The other titles about birds that "rule the sky" are: eagles, falcons, hawks, owls, and vultures. The book is very engaging. It includes wonderful photographs, a few simple sentences on each page, a "parrot fact", and some easy definition of new vocabulary words. We've learned: body parts, perch, tropical and rain forest, omnivore, burrow, down, predator. The supplies we used: fir cone, chenille stems, feathers, black Play-doh for the beak, white school glue. I wrapped a cone with a pipe cleaner, tightened it, and formed the toes with the ends. The parrot is not steady, but can be perched easily onto the edge of a toy. We used mega blocks and doll's furniture for the support. The stem end of a cone is the head. Feathers can be inserted between the cone's scales. 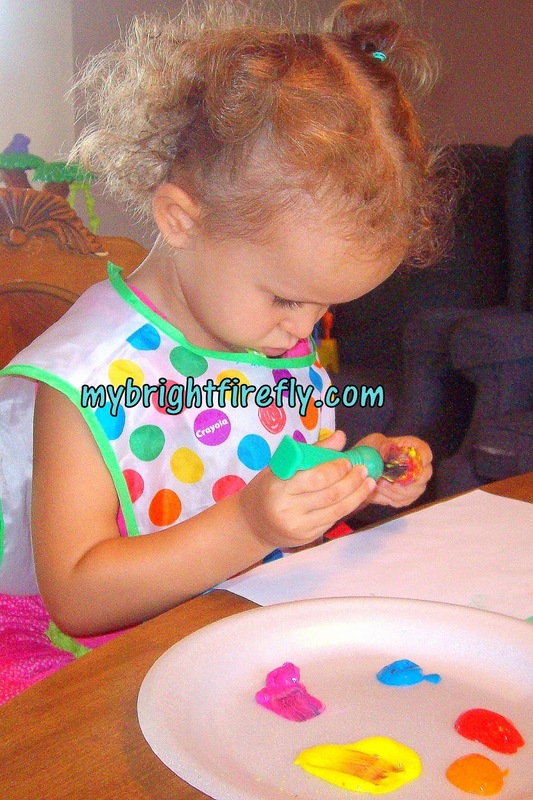 My Firefly chose her colors of the feathers and got busy inserting the feathers to form wings and a tail - a great fine motor skills practice! To make the feathers stay in longer, I glued them in with the regular white glue after she was done. 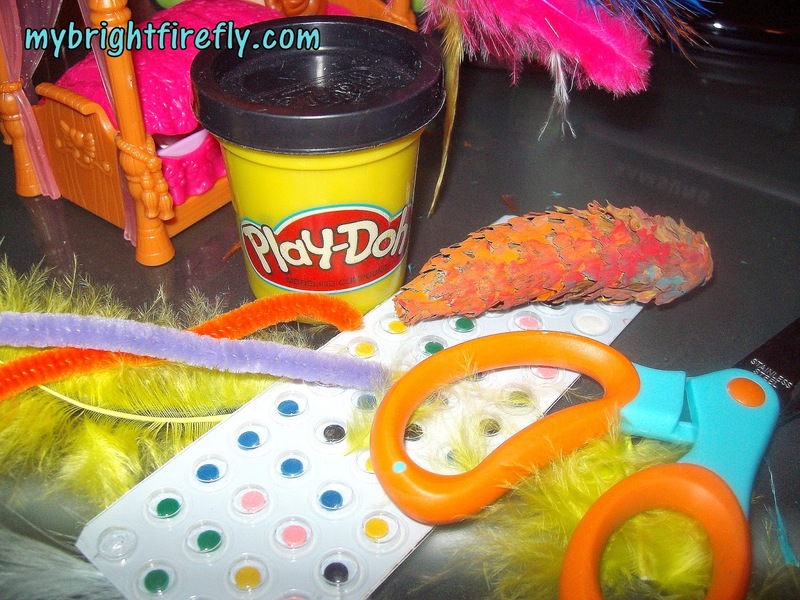 Invitation to play: play dough mat and feathers. This parrot is the same (different) as this parrot. Find a parrot that has something missing. Each parrot is missing something. What is the missing part? This tail is the same color as this tail. But this tail is different. Match the parrots. Which parrot does not have a match? I laminated the picture to make a play dough mat. It doesn't have to be "fancy" though. You can draw parrots black and white free hand on a box. 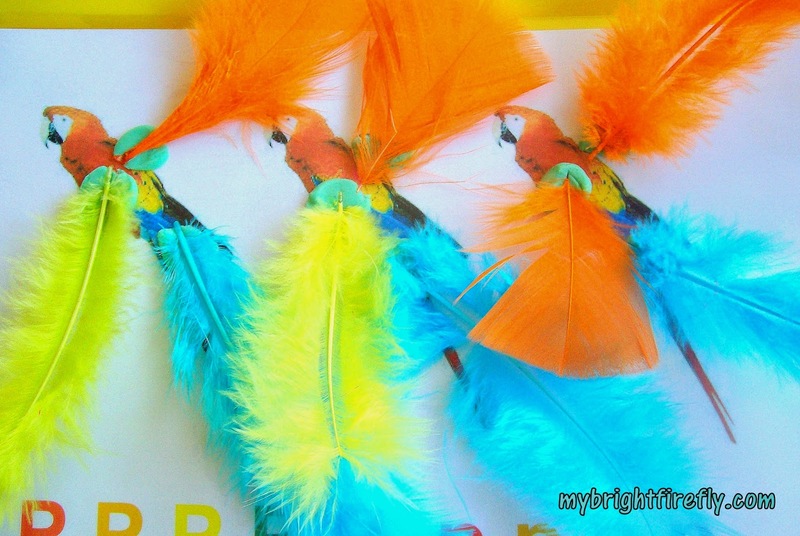 The colorful feathers would make the parrots beautiful. 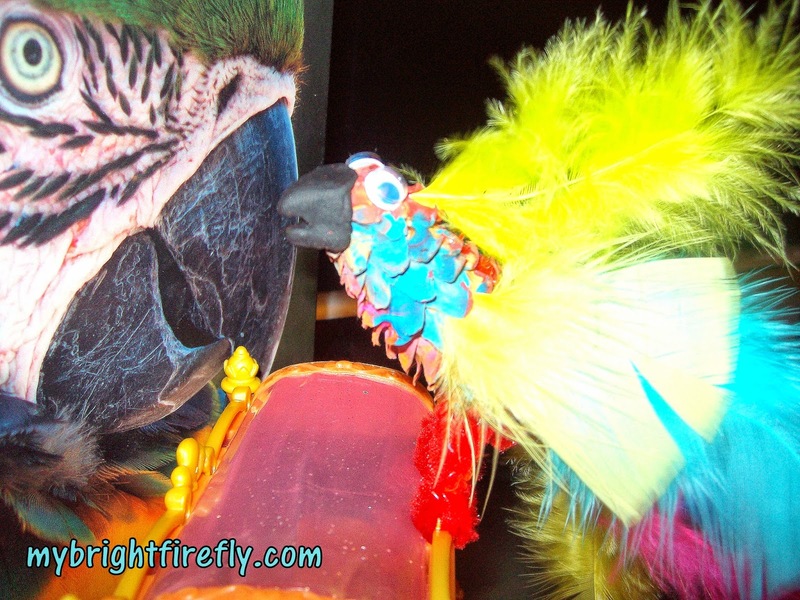 My Firefly loved "building" the parrots to her liking. The difficulty level can be changed easily. Offer just a few feathers to make "the same" tails or wings for an easy level. Add several feathers per each wing and ask to find the same or to change the feathers to make the same to increase the challenge. We extended comparing the birds activity with another great book: "Puffin Peter" by Petr Horacek. Two puffins, the best friends, looked the same: black and white with colorful beaks. After a huge storm at sea, they lost each other. Peter, with the help of a blue whale, visits places all over the world to find his twin. Who is funny and noisy, black and white with the colorful beak? Parrots? Penguins? Toucans? Puffins! Preschool Math can be so much fun! T is for Ten on Top. Preschool Math. 9-11. A Day of Heroes.